Here’s another yummy fall recipe–sweet, tart, cold, warm, and gooey. Slices of green apples covered in warm caramel sauce, white chocolate, chocolate chips and crushed candy bars! What’s not to love?!!? Clean apples with water, dry with paper towels. Slice each apple into 8 pieces. Arrange apple slices onto a large serving platter. Meanwhile, place caramels in a microwave-safe bowl with 1 Tablespoon water. Microwave in 25 second intervals until just melted. 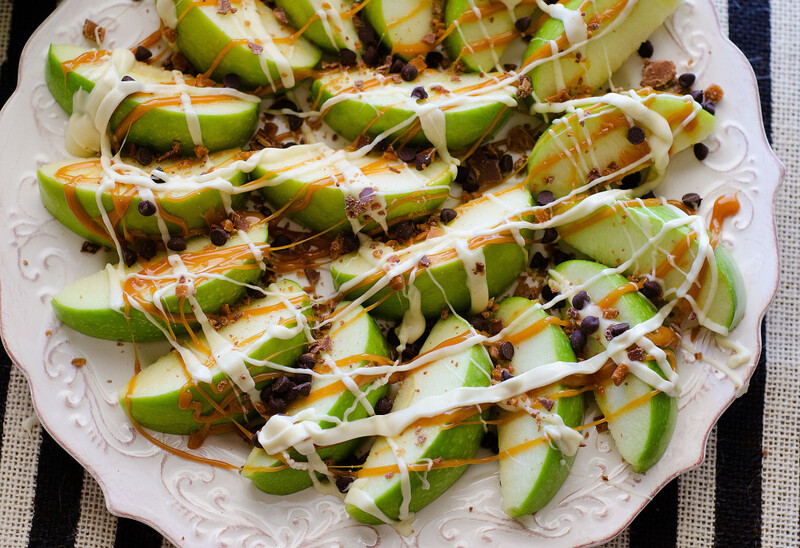 Drizzle warm caramel over apples. Place white chocolate chips in a separate microwave-safe bowl. Microwave in 25 second intervals until just melted. Drizzle over apples. Top apples with mini chocolate chips and crushed candy bar. Serve immediatley and enjoy! To see the original recipe and others like it, CLICK HERE! This entry was posted in Writing Life and tagged family, food, good stuff, links, recipe, Tuesday Treats. Bookmark the permalink. This is very creative and a great alternative for my obsession with cheesy nachos.